This 101' Hargrave is designed for comfort and laid-back luxury! : Atlantic Yacht & Ship, Inc. The 101′ Hargrave is designed for comfort and laid-back luxury! The 101′ Hargrave, “La Dolce Vita,” is designed for absolute comfort and laid-back luxury at sea and in port. Uniquely, the 7’2″ ceilings and counter-top heights convince you that you are on a much larger vessel. Similarly, the full-beam main salon is encompassed within the “wide-body” section of the yacht, adding to its spaciousness. The galley is a signature Hargrave Country Kitchen with large windows and a built-in dinette. The full beam master stateroom is an oasis of calm. Along with the his-and-hers en suite head. The glass shower is centrally located. This allows you to appreciate the full beam of this vessel. Moving up top, to the magnificent flybridge, you will enjoy amazing views. The retractable roof provides plenty of shade when closed. While perfect for sunbathing or stargazing when open. 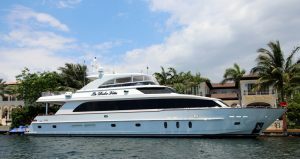 She is equipped with a wet bar and 4 stainless steel bar stools for cocktail hour. Not to mention, the 60 inch-diameter hot tub and sunbathing area. The flybridge is sure to be the prime location for guests. Located on the upper deck is a Quicklift 2000 lb davit, 15′ RIB tender, Yamaha Wave Runner and 4 Kingsley Bates lounge chairs. Furthermore, there is an over sized swim platform which is convenient for water sports activity. Contact Joe Marino at Atlantic Yacht & Ship, Inc. for more information today. Not to mention, the 101′ Hargrave 2009, “ La Dolce Vita,” will be displayed at the Miami Yacht Show February 15-19, 2018. For more show information and where she will be located, click our Event Calendar.